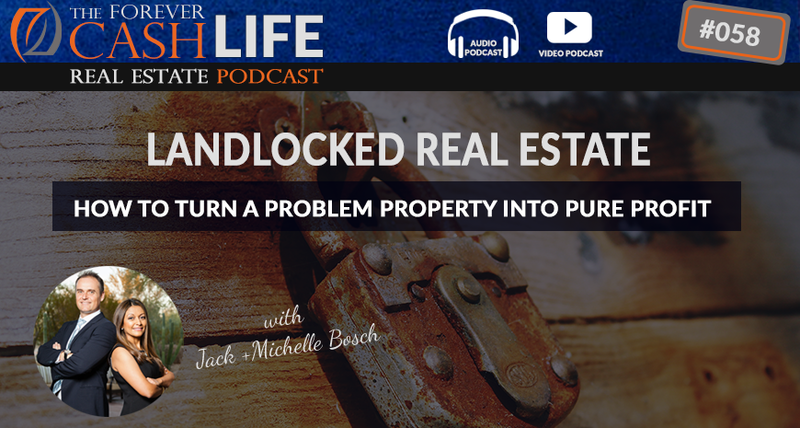 In this episode Jack gives you a crash course into the world of landlocked real estate. You’ll learn the definition of landlocked real estate, as well as all the technicalities around this. This is an excellent opportunity to make huge profits off of land that other people don’t want, just by following some steps that instantly increase the property value. Learn about easements and road access, and how to know whether it’s worth your time to add these into a property. Most importantly, learn yet another amazing technique to make profits in the Forever Cash System. Jack: Hey there, Jack Bosch here with another of our podcast episodes. This is a both video show as well as audio. So, if you’re here on looking at it on iTunes or any of the other Android podcast platforms, then welcome. My Name is Jack Bosch and welcome to the “Forever Cash Life” podcast. In this episode, we are going to talk about landlocked real estate, basically landlocked land. No pun intended, or pun intended, right? So, land that has no road access. So, what we’re gonna do is we’re gonna be right back with the actual episode. Man: Welcome to the “Forever Cash Life Real Estate Investing” podcast with your hosts, Jack and Michelle Bosch. Together, let’s uncover the secrets to building true wealth through real estate and living a purpose-driven life. Well, my first question is always going to be when I chime in on this discussion in our Facebook group, I chime in and I say, “Well, let me ask you, what do you define as landlocked? Is landlocked something that is…just doesn’t have a road to it? Is that a landlocked property?” And most people say, “Yes. That’s landlocked. There’s no road to it.” And I say, I come in usually, I say like, “No, no, no, no, no.” I’ve done over 4,000. I…like Michelle and I, my wife and I. Always point to her because usually sits next to me, but she’s currently out for a few podcast episodes but will be soon back. Michelle, the co-founder of the system and I, we, consider we have done over 4,000 deals. We’ve done research on a lot of these subjects. More research than I ever want anyone or need anyone else in the world to do, or they don’t care about doing, is the definition of a landlocked property is a property that has neither legal nor actual road access. So, what that really means is that a property, if there is a property, piece of land that has…that’s like perhaps one property away from a road and there’s no road going through it, but there is, if the county records show that there’s an easement going for the property, there’s an easement to the property, that means that’s a legal right of access to that property, then this property is not landlocked by the word of the law, as far as I understand it, right? I’m not an attorney, nor did I sleep at a Holiday Inn Express last night. But I have, as I said, I’ve researched that quite a bit. So, the thing here is it’s not landlocked if it has an easement, because an easement means that you can literally go and take a backhoe, take whatever tools you need to do and gray the road over that easement into your property. And the neighbor that over which property that easement is declared on, he cannot prevent you from doing that. So, therefore, that says you have road access anytime you want to have road access by just putting the road where the rights for the road is already established. So, therefore property without a road access isn’t necessarily landlocked. The other option is that there is actually a legal road and then there’s actually a physical road, but there was never given an easement for it. That particularly happens in rural areas. So, let’s say there’s the property here and there’s a road going right next to it. The road is going right here. But if you look at the county records, this road, there is no easement going along here. This road was never given. This road was never…there was never a plan, it was never entered and so on. So, in this case, what happens is if that road which just happens to be like it’s the easiest way to get around, some people in the neighborhood or in the rural areas, they have been using that and they’ve been using that for years. They’ve been always itself taking the long road around the neighborhood, they have taken the short road which passes by the property that you’re just buying, right? Passes right by there. Now, if they have done this over a certain time period, typically depends on how long it is, 10 years in some states, 15 years and others and so on. Then what you can effectively upgrade it is called an easement by prescription, which is basically prescription is another word for customs. But because you used to, like it’s been done so often, then nobody has complained about it, and for so much time that now in effect you have created an easement. In that case, you can go and have that easement be entered into the county records, there might be some bureaucracy around it and so on, and then that easement is there. So, this is also not a landlocked property if there’s an actual physical road there for it. So, the third way that is that if there’s no actual road, no easement, and literally the property doesn’t have any access, that is the only property that is landlocked. So, now what does that mean? Should we stay away from those properties when we do our land deals? Well, depending up to you. I buy them, you just wanna make sure that you buy them at the right price, right? We buy them and we’re buying them, just with the moment we find out that their property is landlocked, the value goes down and therefore, our offer goes down. Let’s say this is a 10-acre parcel in a little bit more rural area, worth $40,000, if it had road access. Well, if it doesn’t have road access, if it’s truly landlocked, well, it’s no longer worth $40,000. It might now only be worth 15 or $20,000. So, you cut… Usually, I personally cut the value at least in half and then I make my offer from there. Now, that’s that by the way. Now, when you do that, you make your offer. Now you’d say you offer a 25% or 20% of the market value, you offer $4,000 for their property and say you get it accepted as thousands of our student deals have shown. There’s not a week or a few days that passed by that in our Facebook group, not somebody has literally posting that they have gotten another deal at 10 cents, at 15 cents, at 20 cents on the dollar. That they flipped them and made 10, 20, 50,000 on those deals. It’s just ongoing, right? It happens on an ongoing kind of thing that happens and it’s really exciting. It’s a really great support group for what we do here. And so in that scenario, you now got this property at 20 cents on its true value and at the same time, let me ask you a question. Does this create an opportunity? And the answer is yes. Absolutely. It creates a big opportunity because you have the ability to now go and either sell as quickly for 12 to $15,000, make a 7 or make an 8 to $10,000 profit on the deal, or what you could also do is you could also see how hard is it to get an easement to that property. Now, here’s a situation. If this property is up here and there’s another one down here without road access, another one, the road is down here and there’s another like four properties between that and the road, well, then you will have to deal with four different neighbors and have them give you access to reach the property. That might be too much to deal with, in which case I would just say, “Put it on our contract for 3,500 or $4,000, sell it for $12. Let the next guy deal with it.” But when you deal with it, when you sell it, you don’t tell the next guy, “Hey, this property doesn’t have road access,” and so on. What you tell the next guy is you disclose that the property currently has no legal and physical road access, but you also say that if you put in the road access to the property, you have the ability of doubling the value of the property. So, now you’re creating an opportunity for that next guy, because if the next guy is willing to go to the effort of creating all these easements, now, he can capture those extra $20,000 in value. So you sell it to him for 12 and he can sell it for 40 once he puts those easements in. I mean that’s a no-brainer for a lot of people. So, you’re creating an opportunity and you’re creating an attractive deal even though the property itself has a problem. You know, that’s the way we’re thinking when we wanna do deals. At the same time now, the other option is if this property is only one removed from the street, then you perhaps can at least contact the owner, contact the neighbor. His information is public record. Send him a letter or look him up, call him and say like, “Hey, listen, here’s the situation. I owned 10 acres behind your property. Would you mind giving me an easement? From what I can tell, your property is the easiest property to make that easement from. There’s a space on the side of your property, wouldn’t affect anything you do and it would really help us. And by the way, by law, you can actually not prevent me from doing that.” The worst case, I mean, you don’t tell them that but necessarily, but for you to know by the way is they cannot prevent you from getting access to the property even if you have to sue them, the judge is then just gonna decide which access is the easiest access to your property. So, if this property is right here and this road is right here, and this would be the easiest access, then the judge is gonna grant that access to the property and they’re gonna give you the easement and so on. But again, the easiest you can do is just contact the neighbor. If the neighbor is reasonable, says like, “Yeah. Can you pay me 500 bucks because I can’t use that? Pay me 500 bucks and you get your easement.” You pay the neighbor 500 bucks and now you have captured the difference between the landlocked value of $20,000 and the un-lanlocked value of $40,000. And now what do you do? You sell the property for 25 or $30,000, or sell it for $35,000 with seller financing, get a 20% down payment. Get a $7,000 down payment, which is almost twice what you paid for the property. Heck, you can even just get a 12% down payment. Get a $5,000 down payment, which is more than what you paid for the property. Have them pay you 5, $600 a month, and it’s all pure profit cash flow for you. So again, I’ll have a problem property which is one phone call to the neighbor, perhaps paying him a little money getting the easement in place. Title companies can help you with that. Title attorneys can help you with that. You can get all of a sudden an extra $20,000 out of a deal, and if you do seller financing on top of it, you get the interest on that which adds up to another 20, $30,000. So, you literally can make literally $50,000 more on that deal than you otherwise would have been able to make. So, that’s how you deal with landlocked properties. First, figure out exactly are they truly landlocked. And if they are, great. Then, you take the next step. If it’s too hard to get the easement, just flip them. If it’s easy to get the easement, get it and capture that upside and now go sell the property for way more than you initially thought it was worth because you bought it or put it on a contract under the premise that it was landlocked. All right. If that was of value, I would love to give this podcast a five-star rating. Go into iTunes, rate us. Leave a comment. The more, the better, five stars is what we want. Everything else doesn’t help. And if you like it here, if you’re watching it on Youtube, go below, put a comment. What I would love for you to know is tell me something that you have been thinking about doing in real estate. As any kind of weird real estate deal that you might have come across, that you’ve heard about. And let’s start a little discussion about that and I wanna see what kind of challenges you’ve had in real estate. And perhaps I do a podcast episode about that too. Then make sure you subscribe to it. Make sure you go join the Facebook group, all these different things. We have a little extra outro here that reminds you of all of that. All right. With that, thank you very much. And see you in the next episode.